INCLUDES 11 NEW SONGS, 16 RHYTHM CARDS, 29 DETAILED WEEKLY LESSON PLANS FOR TEACHERS, AND 12 FREE DOWNLOADABLE SING-ALONG TRACKS. 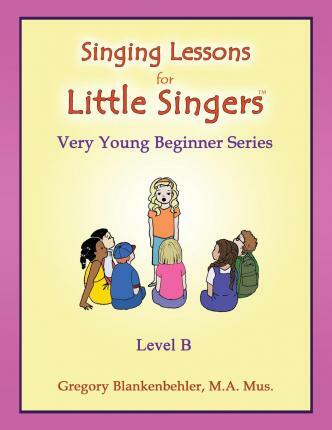 Singing Lessons for Little SingersTM "Very Young Beginners" series is tailor-made for children ages 4 to 7 from current research and practical experience. In three progressive levels, it teaches professional singing techniques and total musicianship skills: Breath support and sustain Vocal registration (high/low voice) Vowels and diction Resonate tone quality Intonation (singing in tune) Solfege scale and intervals Beat and rhythm Reading music Expressive movements, gestures and facial expressions Performance strategies Basic piano and percussion playing Level B of Singing Lessons for Little SingersTM picks up where Level A left off, with 11 new songs and 29 new lesson plans. Throughout Level B there is a strong emphasis on rhythm and melody reading. The rest of the "Body Scale" steps are introduced along with rhythm reading cards (included) and percussion and piano playing.